Here you will find some info about my DCC-system. Its under development. 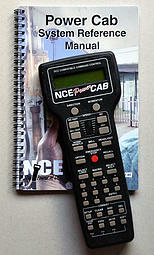 Type of system: NCE PowerCab, with the USB Interface. Powersupply used: 12v, 10A Switched mode. Car bulbs used in the powerline to limit the current. Software: JMRI to run trains and to control the turnouts. Will build CTC-panels for the computer. WiFi Throttle: iPhone WiThrottle and Android EngineDriver. At home I have my own wireless network, where the PC and phones can connect, when we use the same system on exhibitions with my Silver Creek Zmod Module, we use a standalone wireless router to create our own wireless network. Decoders, turnouts: Digitrax DS52 and NCE Switch 8. Have also a few NCE Switch It. Digitrax DZ123Z0, TCS Z2, TCS MZA4 and ESU LokSound micro V3.5.